Let us guide you through your optimal health and wellness options. Learn about what we do in our community and for our patients. Get involved at the local, state, and federal level. Service and support for our community members. Our story and why we do what we do. We have a lot of ways for you to take action. Go to work every day knowing what you do matters. Since the summer of 2014 Virginia Garcia has offered a Student Learning/Internship program. Welcome to the Cornelius Wellness Center. This groundbreaking facility is designed to promote wellness and includes a commercial teaching kitchen, group visit and exercise spaces, public greenways and community gardens. 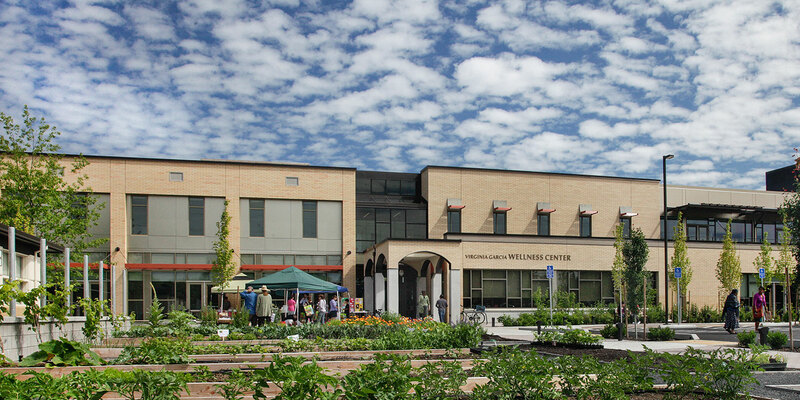 Opened in 2013 The Cornelius Wellness Center is the flagship location for the Virginia Garcia Memorial Health Center. The clinic, which originally opened in 1975 in a 3-car garage, provides primary, dental and vision care plus a full pharmacy to more than 10,000 patients each year. The Cornelius Wellness Center Health and Wellness Fair will be held Friday, August 8 in the parking lot. Visit our Health and Wellness page for healthy tips and tricks as well as delicious recipes. Be sure and bring your own bags for the food. The food bank is open each day while supplies last. Primary Care closes the 2nd Wednesday of the month from 8:00-9:00 a.m.
For urgent issues after hours, current patients can call 800-876-6577 to speak to a provider. Closed daily from 12pm - 1pm for lunch. The Pacific University College of Optometry operates the Vision Clinic in the Cornelius Wellness Center. This health center receives HHS funding and has Federal Public Health Service (PHS) deemed status with respect to certain health or health-related claims, including medical malpractice claims, for itself and its covered individuals. / CCHC recibe fondos del HHS y tiene Servicio de Salud Pública Federal (PHS) considerará el estado con respecto a ciertos salud o reclamos relacionados con la salud, incluyendo demandas por negligencia médica, para sí y sus individuos cubiertos.